Kanchanaburi War Cemetery, Plot 1, Row M, Grave 12, Age 36. With the same background, the following 3 photographs were obviously taken at one location, probably same day. Unfortunately no further information is to hand. The above photos may well have been taken at Esperance during their final leave. McCudden’s fatherJohn Patrick died in June 1947. From Kalgoorlie Miner. Wally McCudden’s parents John Patrick and Emma Ann Foote married 1897 in WA. John McCudden was born about 1867 at Wattle Flats, a NSW mining town and Emma Foote was born SA in1879. She died at Esperance in 1954. They had a large family with several children dying in infancy. The McCudden family resided at Norseman, Kalgoorlie and Esperance. Above a happy departure from Esperance where best mates Wally and White spent their last leave. The above worrying news was printed in July 1942. When Wally’s parents received the above happy news in June 1943 – they were not to know he would die of illness on the Burma-Thai Railway within 2 months. 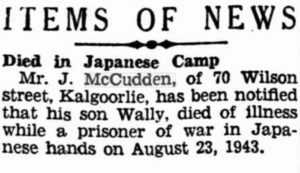 Above: Finally and tragically the McCudden family are notified August 1945 of Wally’s death. 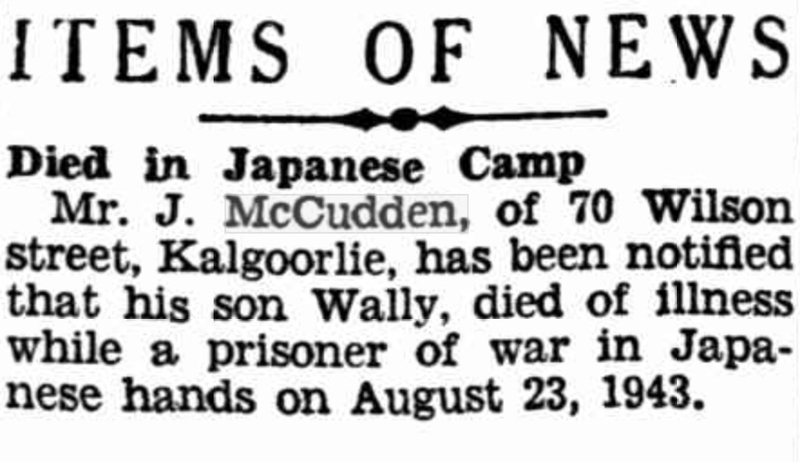 From Singapore, Wally was selected with ‘D’ Force S Battalion to work on Burma-Thai Railway, departing by train 14 March 1943 for Thailand, to the rail-head and Konma Transit Camp. Wally was in ‘good’ company – S Battalion included a large contingency of 2/4th men and would Wally would have been amongst known mates. They commenced working at Tarsau Camp before moving to Konyu II – where life was more than terrible. Starvation, illness, beatings, no medicine and then cholera. Wally was one of many men to succumb to illness on the line. He was evacuated to Chunkai Hospital Camp – he died at the age of 36 years of cardiac beri beri and typhus.